Ten Network. x60mins. 2000. Executive Producer: Craig Campbell. CD (OP) Epic. 5051462000. 2001. 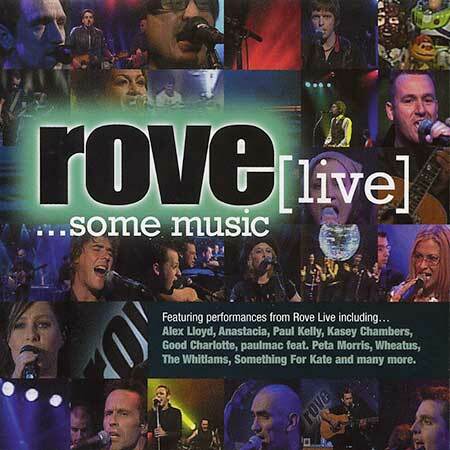 “ROVE [LIVE] … SOME MUSIC”. 02: Somewhere In The City - Paul Kelly. 03: Runaway Train- Kasey Chambers. 04: Just The Thing - Paul Mac. 05: Not That Kind – Anastacia. 06: Three Dimensions - Something For Kate. 07: Little Things - Good Charlotte. 08: 'Coz I'm Free – Christine Anu. 09: Even – Shing Star. 10: The Whitlams – Made Me Hard. 11: Mark Seymour - Don't You Know Me. 12: You Am I – Get Up. 13: Lash – Take Me Away. 15: Area 7 – Bitter Words. 16: (Bonus) Judith Durham – Coulda Woulda Shoulda. CD (OP) Epic. 5051462000. (Includes DVD). 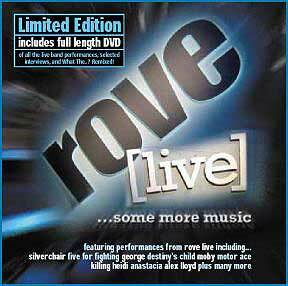 “ROVE [LIVE] … SOME MORE MUSIC”. Includes a CD and a DVD, each featuring fourteen tracks. (Superman) It's Not Easy - Five For Fighting. One Day In Your Life - Anastacia. Breathe In Now - George. Nasty Girl - Destiny's Child. Carry On - Motor Ace. We Are All Made Of Stars - Moby. Strange Relationship - Darren Hayes. Fall For You - The Whitlams. Everybody's Laughing - Alex Lloyd. Outside Of Me - Killing Heidi.